Saudi Arabia's crown prince, 78-year-old Prince Nayef bin Abdul Aziz al Saud, served as the kingdom's interior minister for more than 35 years. He was member of the influential 'Sudairi Seven', and the full brother of the late Crown Prince Sultan. When he was chosen as King Abdullah's successor to the Saudi throne in October 2011, Prince Nayef was a likely choice for the role, two years after being appointed second deputy prime minister. Prince Nayef's appointment as crown prince raised many questions for Saudi Arabia's future, as he was regarded as being more socially conservative and less reform-minded than King Abdullah. Prince Nayef was one of seven sons born to former King Abdul Aziz and Hassa bint-Ahmad al-Sudairi, who became known as the 'Sudairi Seven'. Hassa was said to be the former king's favourite wife, and the sons are considered to be some of the most powerful figures in the kingdom, although only five of them are still alive. Several of Prince Nayef's close relatives also hold senior government posts; his younger brother, Prince Salman, is the defence minister. His son, Mohammad, is Saudi Arabia's counter terrorism chief and was once targeted by an al-Qaeda suicide bomber, but escaped with only minor injuries. Prince Nayef was born in 1934 and was educated at the Princes' School in Riyadh, a specialist school created for the House of Saud's children, and by senior religious scholars. Having studied diplomacy and security affairs, Prince Nayef took up his first government role at just 18 years of age, as deputy governor of Riyadh region. A year later he was promoted to become governor of the region. In 1970 Prince Nayef began working at the Saudi ministry of the interior and by 1975 he was interior minister in the Saudi cabinet, a post he held continuously. King Abdullah appointed him as Saudi Arabia's second deputy prime minister in 2009. He gained more responsibility in October 2010 after King Abdullah suffered a herniated disc in his back, forcing him to rest, and asked Prince Nayef to oversee the annual Hajj pilgrimage, in which over a million foreign Muslims travel to Mecca. Although considered more conservative than King Abdullah, Prince Nayef showed progressive tendencies in the past. In 2001 Prince Nayef publicly supported a move to issue women with their own identity cards, a decision which gave women more freedom in many financial and legal transactions. Before the change was made women could only be registered on their fathers' or husband's cards. 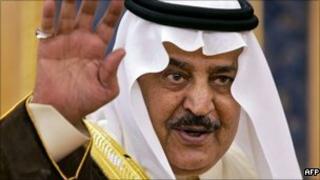 However, he adopted a hardline tone in response to protests in Saudi Arabia prompted by the Arab Spring.